To sustain life, many substances need to be transported into, out of, and between cells. In some cases, this can be accomplished through passive transport, which uses no energy. In many cases, however, the cell needs to transport something against its concentration gradient. In these cases, active transport is required. Active transport requires energy. It is most commonly accomplished by having a transport protein which changes shape when it binds with the cell’s “fuel,” a molecule called ATP. One type of active transport channel will bind to something it is supposed to transport – for example, a sodium ion – and hold onto it until a molecule of ATP comes along and binds to the protein. The energy stored in ATP then allows the channel to change shape, spitting the sodium ion out on the opposite site of the cell membrane. Another type of active transport is “secondary” active transport. In this type of active transport, the protein pump does not use ATP itself, but the cell must expend ATP in order to keep it functioning. This will be explained in more depth in the section on Symport Pumps below. Lastly, active transport can be accomplished through processes called endocytosis and exocytosis. In exocytosis, a cell moves something outside of itself in large quantities by wrapping it in a membrane called a vesicle and “spitting out” the vesicle. In endocytosis, a cell “eats” something by wrapping and re-forming its membrane around the substance or item. Anti-port pumps are pumps that transport one substance in one direction, while transporting another substance the other way. These pumps are extremely efficient because many of them can use one ATP molecule to do these two different tasks. Symport pumps take advantage of diffusion gradients – differences in concentration that cause substances to naturally move from areas of high to low concentration – to move substances. In the case of a symport pump, a substance that “wants” to move from an area of high concentration to low concentration is used to “carry” another substance against its concentration gradient. 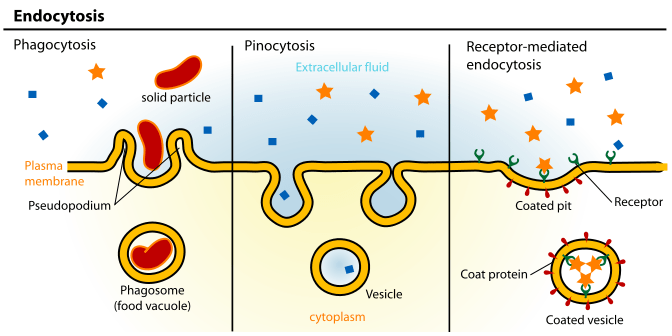 In a third type of active transport, large items, or large amounts of extracellular fluid, may be taken into a cell through the process of endocytosis. In endocytosis, the cell uses proteins in its membrane to fold the membrane into the shape of a pocket. This pocket grows until it is pinched off, re-forming the cell membrane around it and trapping the pocket and its contents inside the cell. The folding is accomplished in very much the same way as the antiport transport of potassium and sodium ions. Molecules of ATP bind to proteins in the cell membrane, causing them to change their shape. The shape changes of many proteins together change the shape of the cell membrane until a vesicle is created. In receptor-mediated endocytosis, a cell’s receptor may recognize a specific molecule that the cell “wants” to take in, and form a vesicle around the area where it recognizes the molecule. In other types of endocytosis, the cell may use other cues to tell when it “wants” to take something in. Exocytosis is the opposite of endocytosis. In exocytosis, the cell creates a vesicle to enclose something that is inside itself, for the purpose of moving it outside. This most commonly occurs when a cell wants to “export” an important product, such as cells which make enzymes, hormones, and antibodies that are needed throughout the body. In eukaryotic cells, protein products are made in the endoplasmic reticulum. They are often packaged by the endoplasmic reticulum into vesicles, and sent to the Golgi apparatus. The Golgi apparatus can be thought of like a cellular “post office.” It receives packages from the endoplasmic reticulum, processes them, and “addresses” them by adding molecules that will be recognized by receptors on the membrane of the cell intended to receive the product. The Golgi apparatus then packages the finished “addressed” products into vesicles of its own, which move towards the cell membrane where they dock and fuse with it. In the fusion process, the vesicle membrane becomes part of the cell membrane, and the vesicle’s contents are spilled into extracellular space. By far the most important active transport pump in animals is the sodium-potassium pump. As animals, our nervous system functions by maintaining a difference in ion concentrations between the inside and outside of nerve cells. It is this gradient that allows our nerve cells to fire, creating muscle contractions, sensations, and even thoughts. Even our heart muscle relies upon these ion gradients to contract! The ability of the sodium-potassium pump to transport potassium into cells while transporting sodium out of cells is so important that some estimates suggest we spend a total of 20-25% of all the energy we get from food just performing this one task! That might sound like a lot, but it is a very impressive task, as it is this pump that allows us to move, think, pump blood throughout our bodies, and perceive the world around us! A famous example of a symport pump is that of the sodium-glucose transport protein. This protein binds to two sodium ions, which “want” to move into the cell, and one glucose molecule, which “wants” to stay outside of the cell. The diffusion of the sodium into the cell allows the glucose to also be carried into the cell without the transport protein expending ATP. However, ATP must be expended by the sodium-potassium pump elsewhere in the cell to keep up the sodium gradient that allows the sodium-glucose transport protein to function. An important example of endocytosis is the process by which white blood cells “eat” pathogens. When white blood cells recognize something that’s not supposed to be there, such as a bacterium, they fold their cell membrane around it to take it into their cytoplasm. They may then merge the vesicle containing the invader with a lysosome – a vesicle containing strong chemicals and enzymes that can break down and digest organic matter. They have essentially just created a cellular “stomach” to “digest” the invader! 1. Active transport requires energy. True. Active transport is called “active” because it requires the cell to spend energy to make it happen. Active transport is transport that would not happen on its own, without cellular energy. 2. All forms of active transport must directly use ATP to accomplish their goal. False. Secondary active transport may use ATP indirectly, as in the case of the sodium-glucose pump. This pump does not use ATP itself, but it does use the concentration gradient of sodium – which is created by the sodium-potassium pump that uses ATP – to accomplish its goal. This form of transport, then, would not work without ATP. It’s just that the ATP is spent by a different transport protein, whose work this protein then takes advantage of. 3. A molecule of ATP can be used many times and still retain its ability to power action within the cell. False. Like firewood that has been burned, the energy of ATP is “spent” after it is used to power a chemical reaction. Unlike firewood, the adenosine phosphate “backbone” of ATP can be re-charged by having more energy added to it in the form of more phosphate groups. To re-charge ATP, however, cells must collect more energy from the environment, such as from sunlight or food. Without energy from the environment, cellular actions powered by ATP cannot occur.